I usually wait till there’s a pre-order link to profile a book debut, but I just got too excited when I saw this cover. Nick Sumida is one of comics’ rising new talents. I bet rising new talents hate to be called that, but I’m sorry, Nick, it’s true. 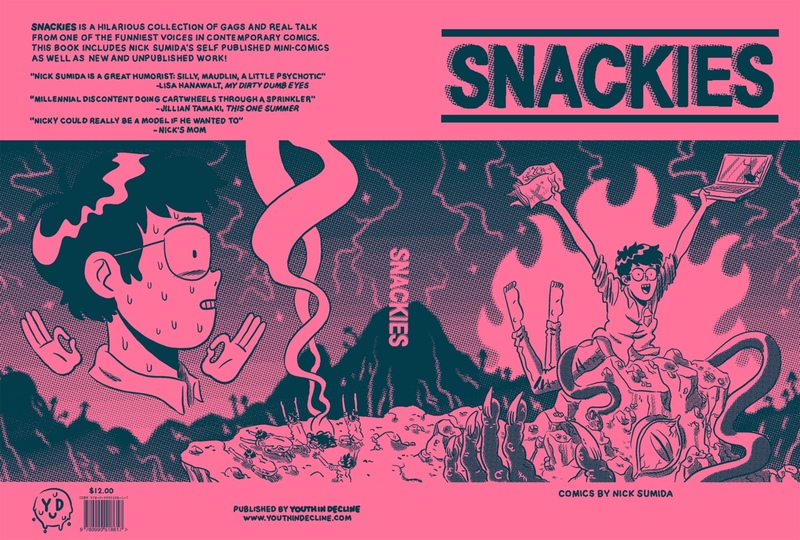 The Snackies minicomics were some of the funniest I’ve read in a while. Youth in Decline is collecting those first two minis, plus 24 pages of additional material, in this collection. Keep an eye on it. This entry was posted in Uncategorized and tagged Nick Sumida, Youth in Decline. Bookmark the permalink. Thank you for writing such glowing words for my son Nick. I agree. Bridget, I host the comics reading event where Nick first read New Voicemails, starring you! He brought down the house! It was the biggest hit we’ve had in the three years I’ve been hosting. Your son has talent!